Safety has been the main concern during the development of this unique scooter. 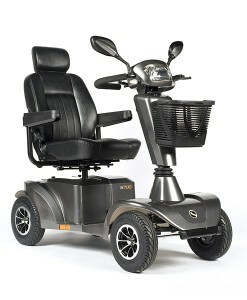 The scooter features an anti-roll structure to avoid any difficulties accessing hills. A manual handbrake has been installed for emergency stopping power and an all-round powerful lighting package comes as standard including high-level indicators. Twin 2A USB Ports for charging your accessories. Batteries are optional item. SKU: S12711. Category: Mobility Scooters.